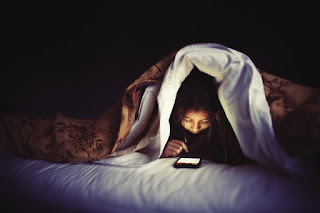 Looking at your smartphones in dark places especially while lying on the bed and the lights are off has been identified as a potential means of going blind temporarily. According to Reports by the New England Journal of Medicine Doctors have linked the danger of using smartphones in the dark to the cases of two women ages 22 and 40 who experienced transient smartphone blindness for months. The women were reported to have complained of recurring episodes of temporary vision loss for up to 15 minutes. The women were subjected to series of MRI scans, heart tests and other medical exams but result of everything failed to explain the problem. "So you have one eye adapted to the light because it's looking at the phone and the other eye is adapted to the dark"
When they put their phone down, they couldn't see with the phone eye. "That's because it's taking many minutes to catch up to the other eye that's adapted to the dark"
He said the temporary blindness is ultimately avoidable if smartphone users will stick to looking at their smartphones with both eyes. Although Dr Rahul Khurana of American Academy of Ophthalmology has doubted the claims saying that two cases were not enough to prove that operating smartphones with one eye can cause temporary blindness. Do you think one-eyed smartphone use can cause temporary blindness? Let's have your opinions and other contributions in the comments box below this page. As for me, I think it's possible when it becomes an habit. Sometimes my eyes don't adapt in time after staring at my phone for long in the dark. Software is being developed continuously and, in the not too distant future, technology will be available that will make Smartphones a staple in any home.